Family practices have unique needs. Learn how Veribook meets these needs by offering an online scheduler that integrates with OSCAR EMR to enable medical clinics, physicians, and medical offices to easily schedule patient appointments and bookings. By default, and included within our standard pricing, all appointments booked online will receive an automated email reminder. Conveniently, our reminders include quick links to make it easy for patients to cancel or reschedule. These reminders reduce no-shows and missed appointments and can include customized instructions to ensure patients arrive prepared and on time. A common question is whether we offer text / SMS reminders. At the moment, this is not a feature that we support for appointments booked online. We discuss why here. For a small additional charge, appointments added to your EMR manually when a patient books by phone or in person can be sent email reminders as well. Notably, patients will be directed to contact the clinic directly to cancel or reschedule if necessary. Appointments scheduled by phone or in person cannot be modified online. Lastly, for appointments booked by phone or in person, SMS appointment reminders can be sent, on special request and at additional cost. Please contact us for more details as the pricing will vary based on the number of monthly reminders as well as the content desired. Emails reminders can be sent for appointments of some or all clinicians. Different emails can be sent to different colour-coded appointments. 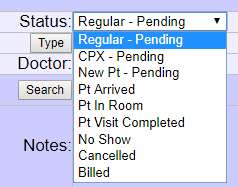 Reminders are usually configured to be sent en masse the morning of the preceding day, to give patients enough time to reschedule or cancel appropriately. SMS reminders are an option, on special request, at additional cost.